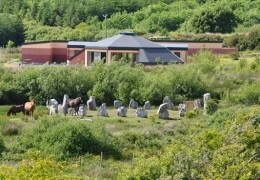 Situated along the Wild Atlantic Way, just a short walk from the pretty little harbour village of Ballyvaughan in the heart of The Burren, lies the hidden gem Hazelwood Lodge. With the feel of boutique hotel, the McSweeney family have made this welcoming and elegant accommodation, into a home away from home that will have you wishing to return as soon as your leave their door! 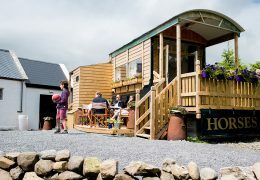 This special family-run accommodation lodge in the Burren prides itself on offering all visitors the warmest of welcomes and will assist you in every way possible in planning your stay to ensure you get the most out of your visit to one of the most spectacular areas of Ireland. Hazelwood Lodge offers the use of bicycles with safety equipment to guests and fishing tackle is also available to use. On your arrival to Hazelwood Lodge, your hosts Victor and Geraldine will help you plan the perfect holiday and give tips on local sights, hidden gems and the best places to stop in and around Ballyvaughan. The house has 8 spacious and impeccably presented bedrooms that can accommodate up to 20 guests. There is also a lovely dining room and beautifully appointed cosy residents lounge. 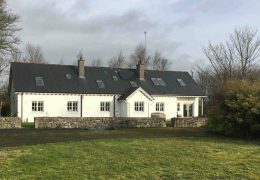 The house has been extensively renovated and has featured on the RTE programme “At Your Service” in 2016. Free Wi-Fi is available throughout the lodge for those who want to stay in touch while on their travels. Wake up in your comfortable and elegant room to a delicious breakfast cooked to order in the dining room to set you up for your day of exploring the wilds of Co Clare. Before setting off you can consult Hazelwood Lodge’s bespoke list of top things to do while staying here to assist you in getting the most from your adventure in Co. Clare. Upon your return there is a drying room available exclusively for guests to lay out all your walking gear, so after a hot shower or warming bath in your ensuite bathroom, curl up and unwind by the open log fire in the lovely residents’ lounge. 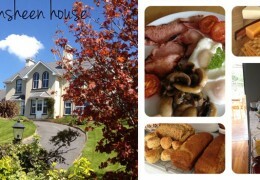 Hazelwood Lodge would like to offer all our potential guests a warm welcome and Céad Mile Fáilte. Whatever it is you’re looking for – walking family adventures, a cosy romantic break, or simply relaxing with friends over good food and drink – you’ll find it all here at the Hazelwood Lodge, Ballyvaughan, Co Clare!